In the 1970s, red spruce was the forest equivalent of a canary in the coal mine, signaling that acid rain was damaging forests and that some species, especially red spruce, were particularly sensitive to this human induced damage. In the course of studying the lingering effects of acid rain and whether trees stored less carbon as a result of winter injury, U.S. Forest Service and University of Vermont scientists came up with a surprising result -- three decades later, the canary is feeling much better. Decline in red spruce has been attributed to damage that trees sustain in winter, when foliage predisposed to injury by exposure to acid rain experiences freezing injury and dies. Paul Schaberg, a research plant physiologist with the U.S. Forest Service's Northern Research Station in Burlington, Vt., and partners studied red spruce trees in Vermont, New Hampshire and Massachusetts. They found that the influence of a single damaging winter injury event in 2003 continued to slow tree growth in New England for 3 years, longer than had been expected, and had a significant impact on carbon storage. They also found something they did not expect. "The shocking thing is that these trees are doing remarkably well now," said Schaberg, a co-author on the study. Researchers found that diameter growth is now the highest ever recorded for red spruce, indicating that it is now growing at levels almost two times the average for the last 100 years, a growth rate never before achieved by the trees examined. "It raises the question 'why?'" Schaberg said. The theories that Schaberg and his colleagues are eager to test include whether the red spruce turn-around can be credited to reductions in pollution made possible by the Clean Air Act of 1990, which helped reduce sulfur and nitrogen pollution. Another possibility is that red spruce may be one of nature's winners in the face of climate change. For red spruce, warmer winters mean less damage to foliage, which limits growth. Questions for future research also include whether the historic growth rate will continue or whether it will plateau. 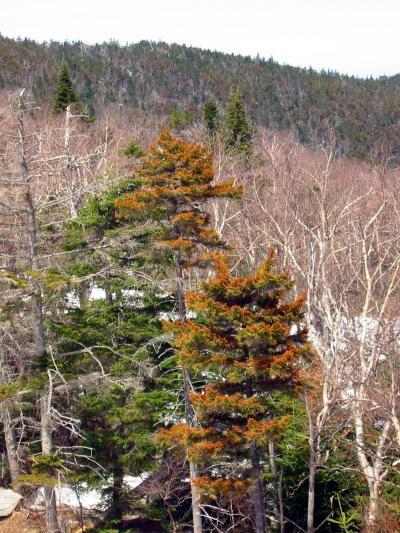 The rebound in red spruce growth is described in a study co-authored by Schaberg with Alexandra Kosiba, Gary Hawley and Christopher Hansen, all from the University of Vermont. The study, "Quantifying the legacy of foliar winter injury on woody aboveground carbon sequestration of red spruce trees," was published earlier this year in the journal Forest Ecology and Management. "Forest Service science was at the forefront in identifying acid rain and its impacts, and it is enormously gratifying to be at the forefront of discovering this amazing turn-around in red spruce growth in New England," said Michael T. Rains, Director of the Northern Research Station and the Forest Product Laboratory. "Whether this is a success story for pollution control or a developing story about the effects of a changing climate, we are not yet sure." In addition to finding the surprising rebound in red spruce growth, Schaberg and his colleagues also answered the question they set out to answer -- how did the foliar damage associated with the 2003 winter injury affect carbon storage? They found that the winter injury event reduced the growth of red spruce trees for at least 3 years and resulted in cumulative reductions across the landscape equivalent to the carbon produced by burning 280 million gallons of gasoline. Historically, red spruce has been an important timber species in the United States. While it remains a major commercial species in Canada, in the United States acid rain and land use changes have resulted in the loss of many red spruce trees.